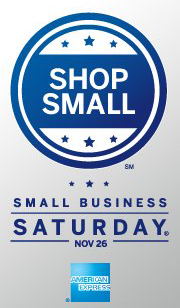 Tomorrow (Saturday, Nov. 26) is Small Business Saturday. Please do consider patronizing small businesses, including the Cool Jerk store. You need to go to the website and register your American Express card in order to qualify, but the gist is: spend $25 or more at a small business with your AMEX card and you’ll get a one-time $25 reimbursement. Be sure to check their website for all the details. What we’re talking about is $25 in free purchases, basically. Instead of rejiggering all the pricing on my store for this one day, just mention AMEX in the checkout (when it asks for Special Instructions) and I’ll honor the special pricing. I’ll issue a refund for the difference.